Orders with a total amount below $10 will not be processed. Thanks. The most distinctive aspect of this tree is the red, furry figs in short clusters, which grow directly out of the trunk of the tree. This fig tree is sacred in Hinduism and Buddhism. 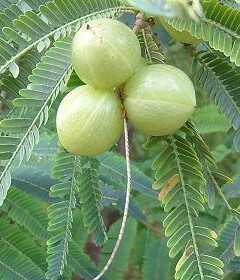 Its fruits and young leaves are edible, and many parts of the tree is used for medicine. A great shade tree to plant around the house or temples. Makes a good house plant. Cucumis melo is a ANNUAL CLIMBER growing to 1.5 m (5ft). It is hardy to zone 10 and is frost tender. 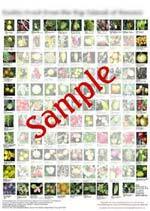 It is in flower from Jul to September, and the seeds ripen from Aug to October. 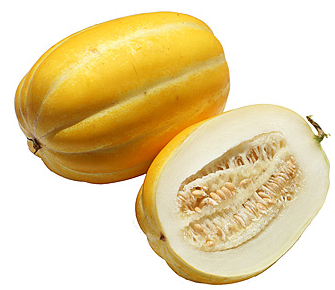 This Korean melon produces fruits with golden color skin and silver lines running end-to-end. The white flesh is very crisp and sweet. Fruits are oblong, and weighs 250-450 grams. The plant grows very well in greenhouse and open field. Excellent fruit settings. Highly recommended for home gardening. Description: A small plant with the typical banana-like growth habit to 4-6ft high and 3-5ft wide. The leaves are quite large and can grow to 12-24". While not dwarf in form, this species generally remains quite small and can flower and fruit in just over a year from seed. 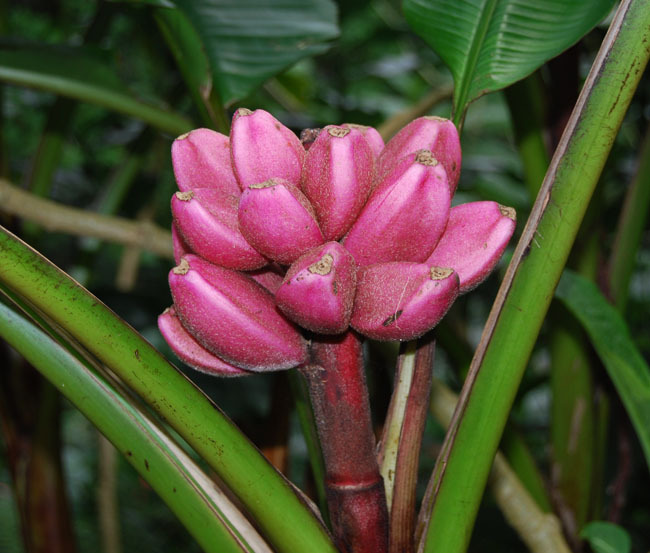 The pink fruits are covered with thin hairs, hence its alternative common name, the Hairy Banana. Natal Plum, Noem-Noem (Trái Táo)Originating in South Africa, C. macrocarpa, or Natal plum, grows well with salt-laden winds, making it a good choice for coastal areas. This plant grows quick and can grow in shade, partial shade, or full sun. Natal plum is a popular choice for hedgesShiny, deep green leaves; snowy white flowers with fragrance that intensifies at night; long flowering-season; ornamental plump, round, crimson fruit in summer and fall at the same time as the blooms. In warm areas the fruits appear through the year. They can be eaten out of hand or made into pies, jams, jellies, and sauces. 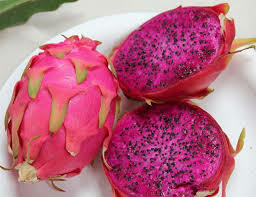 The fruit is rich in Vitamin C, calcium, magnesium and phosphorus. 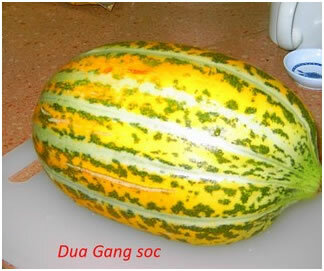 commonly known as gac (IPA: /gæk/, from Vietnamese: gấc, or quả gấc [quả meaning "fruit"]; in Chinese:), is a Southeast Asian fruit found throughout the region from Southern China to Northeastern Australia. It is also known as Baby Jackfruit, Spiny Bitter Gourd, Sweet Gourd, or Cochinchin Gourd. It has been traditionally used as both food and medicine in the regions in which it grows. Grows throughout much of China and Tibet, this berry is claimed to be "the most nutrient-dense food on the planet." It has 18 kinds of amino acids (more than bee pollen), up to 21 trace minerals and more carotenoids, (more beta carotene than carrots). It contains 500 times the amount of vitamin C, by weight, than oranges. Goji berries also contain vitamins B1, B2, B6, and Vitamin E. It is a good source of polysaccharides, which is believed to strengthen the immune system and slow the aging process. Fresh and dried berries are sweet and eaten like snacks. Goji berries have been used in Asia for many centuries as a health food and traditional medicine. They are used as a health tonic to increase longevity, as medicine to treat liver and kidney problems as well as to lower cholesterol and blood pressure. They are believed to enhance immune system function, help eyesight, protect the liver, boost sperm production, and improve circulation. This small or medium sized tree native to China and Japan. It can be grown in containers. 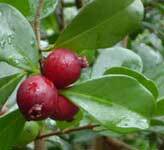 It has beautiful downy foliage, fragrant flowers, and delicious fruit. 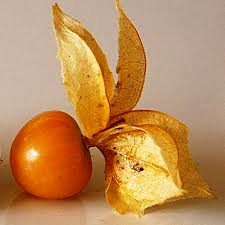 The golden-yellow fruit has a distinct flavor like pear, with a hint of apricot and pineapple. It can be eaten raw, stewed, preserved, or dried. This tropical fruit tree bears edible fruits the size of a golf ball. The young fruit is green, turning yellow when ripe. The flesh is fragrant. New cultivars offer bigger, crunchy fruits. South-American variety (strawberry guava) has purple-red fruits and shiny leaves. Tamarind (Me Dốt) - This tree makes a nice pot plant with double leaves in bright green color when young. 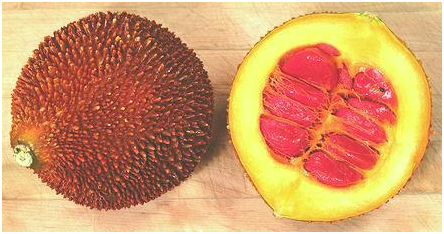 Young fruits (very tart) are used in many tropical dishes. Mature fruits are sweeter, used to make candies or refreshing drinks. This makes a nice houseplant. Very easy to grow indoor. Purple-red flowers; shiny yellow fruit with 5 pronounced ribs. Pretty double leaves and curious looking fruits having star-shape when sliced. 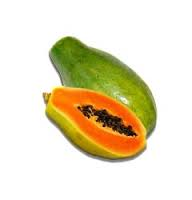 Solo Papaya : weighing about 16-20 ounces with a nice aroma and sweet flavor. Most popular variety grown worldwide. An interesting plant with big serrated leaves, believed to have many medicinal uses. Fruits are yellow-orange, sweet and fragrant. Jamaican Cherry, Capulin, krakhôb barang, kersen, talok, kerukup siam, datiles , takhop farang, krop farang ,(Trứng Cá) - Muntingia calabura A very exotic fruit tree rarely seen in North America. One of the fastest-growing fruit trees. Velvet green leaves, soft-haired spreading branches, bright pink fruit turning red when mature. Fruits are sweet, usually eaten fresh. The bark can be made into ropes. This is a small evergreen tree recognized by its straight trunk, large green leaves, white tubular flowers and distinctive yellow fruit. Polynesians named this plant 'noni' which translates as "A Gift from God". According to Polynesian healers, Noni juice stimulates the body's immune system and improves your vitality. The islanders have for centuries been using this juice against asthma, arthritis, infections, high blood pressure, diabetes, depression and lots of other health problems - it's also used as as a pain reliever. A rare fruit tree with bright green double leaves. Clusters of yellow fruits are born on tree trunk and branchs. Can be eaten fresh (with salt to minimize the acidic taste), or made into a jelly. This tree not only produces pretty bright orange flowers year round, it also makes beautiful fruits that last for months. 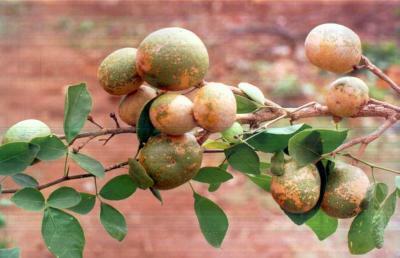 The fruits are cream-yellow when young, then gradually turn purple-red when mature. Dwarf variety can produce fruits on 1-foot high plants. The upright tree has compact branches bearing bright green leaves. This fruit tree has origin in the Amazon rainforest. Suitable for indoor growing in containers. 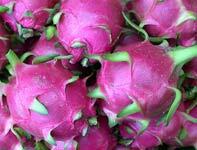 The fruit is very sweet, delicious, and fragrant. Longan, Dragon Eye Fruit, (Trái Nha~n) - Dimocarpus longana Very nice fruit tree with double bright green leaves and beautiful beige fruits in upright clusters. - This fruit tree has beautiful two-toned leaves. Fruits are sweet and yield milk-like juice when pressed. Fruit can be eaten fresh or used in ice cream. Bark, latex and fruit and seeds have medicinal value. Wood is suitable for construction and branches are used as an orchid growing medium. Also planted as an ornamental. 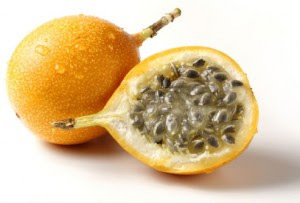 An egg-shaped tropical fruit that is also called a purple granadilla, the passion fruit has a brittle, wrinkled purple-brown rind enclosing flesh-covered seeds, something like a pomegranate (granadilla means "little pomegranate" in Spanish). The seeds are edible so you can eat the orange pulp straight from the shell. Passion fruit is more commonly sieved and its highly aromatic pulp and juice are used as a flavoring for beverages and sauces. The pulp has an intense aromatic flavor, while the texture is jelly-like and watery. A good source of vitamins A and C, as well as potassium and iron. 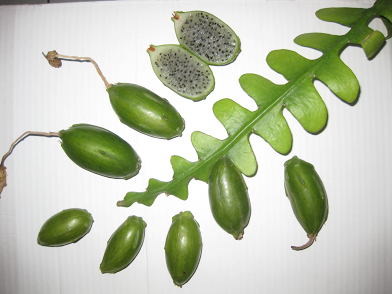 Passionflora foetida, Love-in-a-Mist, Bejuco canastilla, chulupa de loma, cinco llagas (Nhản Lồng) - An unusual wild passion fruit with small fruits covered by lacy bracts. Young leaves and plant tips are edible. Dry leaves are used in tea by natives to relieve sleeping problems. Vigorous vine that flowers heavily and fruits without hand pollination. Easy to cultivate in a container and will do well as a houseplant. The fruits are kumquat sized with a thin, scarlet red shell surrounding a blush-white pulp, mildly sweet, delicately flavored. PSIDIUM cattleianum "Strawberry guava"Native to Brazil. This shrubby Guava may reach 25' but can be pruned to desirable size. 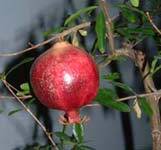 Its sweet fruits are the size of a large grape with reddish color and white pulp. Harydy to zone 10. Grown as houseplant in colder areas. MUSELLA lasiocarpa "Golden Lotus Banana" This rare type of banana plant grows to 6-ft high, and is hardy to 10 degrees F. when mulched sufficiently to protect from extreme cold. It does not produce a fruit. It does produce outstanding banana foliage and a proliferation of extremely large, erect, yellow flowers that are very showy and can last to 6 months. 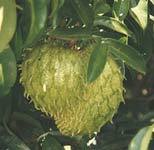 AEGLE marmelos "Bael Fruit" A deciduous spiny tropical tree to 10'. It's 4" oval fruits are very aromatic with a pungent tasting pulp. Highly esteemed in its native regions where it is also recognized as a medicinal and sacred. 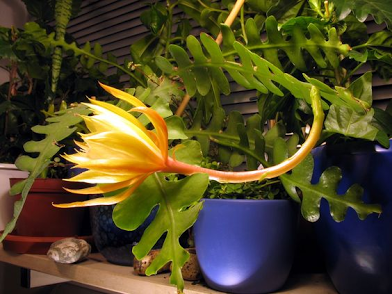 Produces fragrant flowers and 3" crenelated leaves. A curious-looking lime with unique aroma. Both leaves and zest are used to flavor Thai salads and soups. The leaves are shaped like an '8' . Leaves can be used whole, either fresh or dried. Used extensively in Thailand and Indonesia in curries and soups including Thai Tom Yums, fresh Kaffir Lime leaves can also be used in salads. Always try to select the young tender leaves as older leaves become bitter. If you only have older leaves, tear the leaves away from the midrib which is the source of the bitterness. The grated rind of the Kaffir Lime fruit is also used in some Asian cuisines and is an essential ingredient for curry pastes in Thailand, Laos and Cambodia.